We recently celebrated Asheley’s 30th Birthday, which turned into a weekend festival of dinners with family and friends. It also featured a trip into the city to cross off one of the restaurants that has been on our list to try for a long time now, but one that needed a special occasion reason to rationalize spending the money on the lavish menu: Del Posto. Just steps from Chelsea Market and two other high-class restaurants (Morimoto and Colicchio & Sons), Del Posto is located at 85 Tenth Avenue between 15th and 16th Streets. Owned by famed-trio Mario Batali, Joe Bastianich, and Lidia Bastianich (whom co-own a slew of other restaurants, including one of my favorites, Otto Enoteca & Pizzeria), Del Posto is an explosion of Italian grandeur and opulence. It has received 1 Michelin Star (they did have 2 at one point) and under the expert direction of Executive Chef Mark Ladner, has earned 4 stars from the New York Times. From the outside, the restaurant entrance resembles that of a four-star hotel. 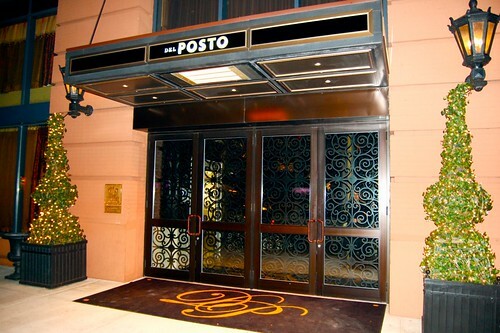 Inside, we were amazed by Del Posto’s luxurious and spacious grandeur. It is an absolutely stunning space. Wrought-iron permeated the decor, including a beautiful grand staircase and balcony that was adorned with flickering tea-lights. The restaurant was filled with sounds of happy diners and a live pianist, who was playing the Beatles’ tune “When I’m 64” as we arrived just in time for our 8:45 reservation (finding a parking spot was more of a hassle than normal). We were escorted around 8:55 by the maitre’d to a very spacious table. The warmness of the staff was immediately felt by us both, as every employee we passed in route to the table stopped and gave us a welcoming smile and hello. We couldn’t believe the abundance of room in between each table. In a city where real estate comes at a high price, every single square footage of restaurant space is a precious commodity. Every other fine-dining restaurant I’ve dined at in Manhattan tend to squeeze in as many tables as possible. I’ve come to expect that part of the NYC dining experience is to overhear other people’s conversations due to the proximity, but alas, tonight was a pleasant anomaly. Nice touch: Even Asheley’s purse got a seat at the table, as a member of the waitstaff brought over a little plush stool for it so it didn’t have to remain on the beautifully carpeted floor. We’ll get to the food in a second, but the thing that struck us most during our meal at Del Posto was the impeccable service. At 99% of restaurants, the service staff responds to your needs as a customer. Good ones respond quickly, and bad ones, well… you wait and wait in frustration. At Del Posto, however, the service team anticipated every single one of our wants and needs, to the point where we literally didn’t have to ask for anything. They were genuine and attentive to every detail. Water and wine was replenished regularly. Plates were cleared in a timely fashion, but without feeling rushed. New silverware was promptly set for every course. The best I can sum up the service: they were like service staff secret agents that knew our every move and anticipated our needs, but were so discreet that we never seemed to notice their movements. As we sat down at the table, no menus were offered. We were given a couple minutes to just soak in the beauty of the restaurant and the atmosphere it created. Most diners were dressed in business casual, with many women in dresses and men wearing jackets… except this guy (me! ), since my suit was feeling a bit too, well… “snug” as of date. In addition, it seemed like the outside world that we are so accustomed to being connected to 24/7 thanks to smart phones and social media, ceased to exist. Everyone was simply enjoying their meal and the company with which they sat. Not one single person we saw was on their phones, well that is except me, who immediately had to check in on foursquare! A trio of assiagi (Italian for “taste”, same as the French amuse bouche, which is a bite-size appetizer) for each of us graced the middle of the table. We first ate a grilled ham (prosciutto maybe?) and cheese panini, which was creamy porky goodness. Then, a tiny handheld cup of a delicious brothy soup, with the rim coated in fine breadcrumbs (nice touch and an idea I’m totally stealing when I entertain at home). Finally, an amazingly creamy risotto ball of sorts, which was divine. A great way to start the meal… but wait, what… another trio of assiagi was placed on the table?! We first ate a raw preparation of tuna and jalapeno encased in some sort of delicate wrapper, which unfortunately lacked any heat and featured little flavor overall. Next, there was a little-too-salty chickpea puree fritter, and finally a delicious little fried mozzerella that was also a bit salty but still very good. Soon after the second round of the Assiagi was completed, a wine list that was more like an overwhelming leather bound novel, arrived to our table. Being a complete wine novice, an incredibly knowledgeable and enthusiastic sommelier came over to discuss wine options with us. He found a great wine in a comfortable price range, a Barbera D’Alba 2009 ($65). Soon after ordering the wine, a linen-draped cart was steered over to the table with our bottle of wine and impressive stemware. The opening of the wine was a spectacle all in itself: she poured a little wine into each glass, turned each glass almost horizontal and slowly swirled the wine around to completely coat the inside of the glass. Menus for dinner were then presented and explained to us by our captain. We agreed on the five-course tasting, which presented us with more options. We each got to pick one antipasti (appetizer), one secondi (main dish), and one dessert. In addition, two pastas have to be decided upon for the entire table, but since we were only a party of two, we in essence each got to pick our own pasta as well. As I ordered (taking the recommendations of other reviews I read online just prior in the day), I asked our host for her thoughts on what we ordered. She was incredibly knowledgeable on the entire menu and made some excellent suggestions. Here is where it got interestingly awesome: our captain asked us if we planned on sharing each others dishes for each course (yes) and if so, did we have any time restrictions in how long we had to dine (no). So what did she end up doing for us? Each dish was presented to us on our own plate, thus making our meal not a 5 course dinner, but 10. Although we were each served half portions of every dish, each plate was still quite bountiful! The bread basket I’ve heard so much about soon followed. 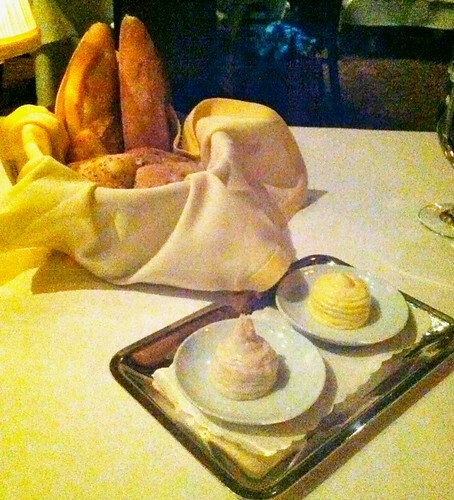 All the bread is made in-house by Ernesto Gonzalez, who was trained by well-known bread baking expert Nancy Silverton. Head Honcho of Serious Eats, Ed Levine, names it one of if not the best bread baskets in New York City. Gracing the bread basket were mini-baguettes with amazing hole structure and flavor, a super soft and pillowy thyme foccacia, an olive ciabatta (which I didn’t care for just because I’m not an olive fan), and multi-grain rolls. The breads were served with an unsalted sweet cream butter from Emiglia Romagna and amazingly good whipped lardo (pork fat) seasoned with rosemary and garlic. And then came the feast: the food was brought out at a steady but leisurely pace. Never was there a large pause in the progression of the meal, but there was still time to relax and semi-digest between courses. 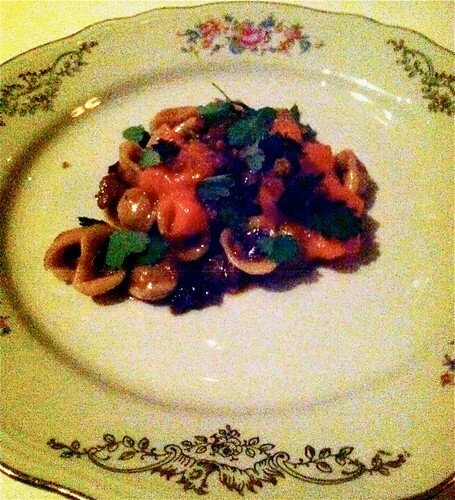 First came Charred Octopus with Umbrian Garbanzo Beans and Celery Hearts. Our plates were placed down in front of us simultaneously by two members of the waitstaff as our captain impeccably explained what we were being served (both of which were done for every course), and a waiter came over to complete the dish tableside with a drizzle of 25-year aged Balsamic vinegar. This was an amazing dish, and although I typically do not enjoy celery, it was very faint and worked for this dish. 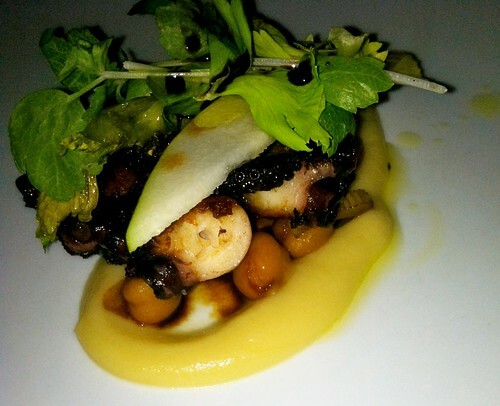 I noticed that Batali likes to pair octopus with celery, since he also does it at his casual enoteca Otto. 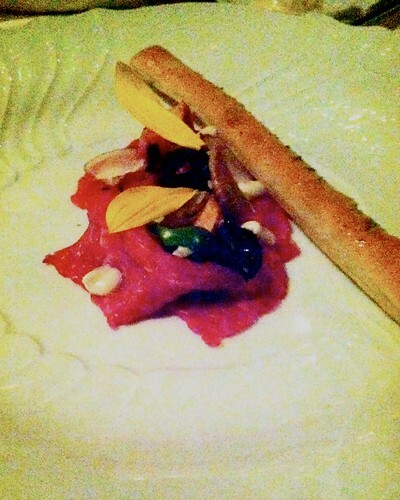 Next, we thoroughly enjoyed the Beef and Truffle Carpaccio with Sunchoke Spuma and Sage Grissini. The dish was adorned with a couple sunflower petals. This dish is worth every penny of the $10 supplement. It was well seasoned and the truffle added earthiness to the dish. Note: sunchoke spuma was simply a sunchoke spread, and grissini is a breadstick (which was brushed with some beef fat that took it over the top from good to great). Before our ordered pasta courses were brought out, a surprise course was presented to us (Asheley has a friend of a friend who is the sous chef at Del Posto). 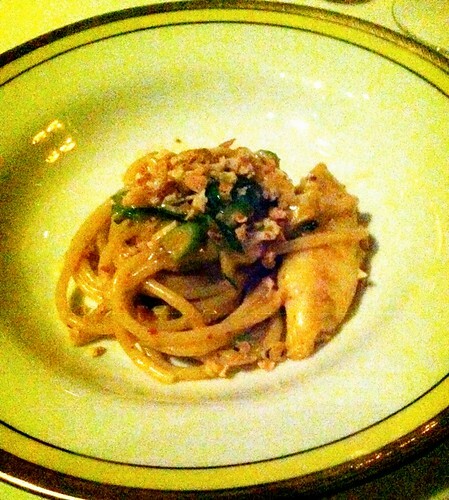 It was Spaghetti with Dungeness Crab, Sliced Jalapeno and Minced Scallion. The pasta was cooked perfectly and the jalapeno added just the right amount of heat. Back to our regularly scheduled pasta courses, first out was an absolutely spectacular Orecchiette with Lamb Neck Ragu, Orange Carrots, Rye Crumbs, and Toasted Sage. 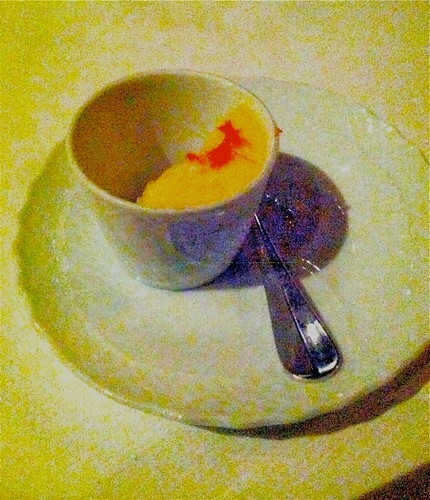 The carrots added a perfect hint of sweetness to the dish that really complemented the amazing lamb ragu. This was my favorite pasta dish. We finished the pasta round with Yesterday’s 100 Layer Lasagna alla Piastra. This lasagna is literally 100 layers, alternating razor thin homemade pasta sheets, bechamel sauce, and a meat sauce. 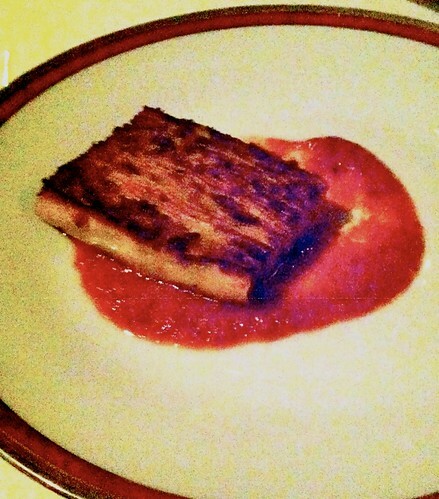 It is then finished off “alla Piastra”, meaning on a griddle, so it develops a nice golden crust. 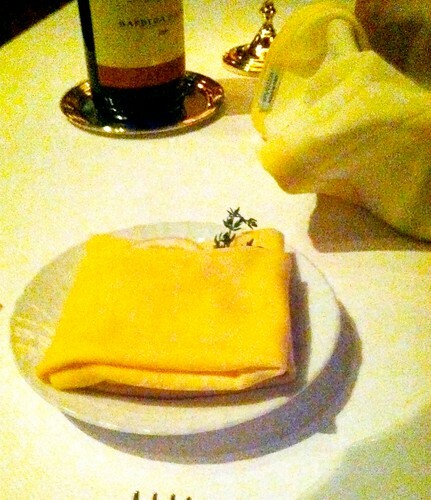 Since we were splitting the dish, we each got 50 layers (yes, I counted…). Although an overall impressive dish and one I was really looking forward to eating, this was definitely not as spectacular as the Orchiette with Lamb Neck Ragu. Onto the secondi courses, first up was Sardinian Lamb Chop, Roman Artichokes, Bruised Mint and Saffron Poatotes and Lamb Neck. 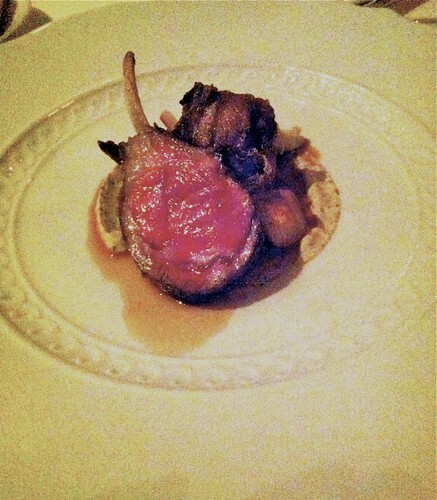 The lamb chop was so tender and a perfect medium-rare. The slow-cooked lamb neck was fork tender and so moist. This was absolutely delicious! Since it was recommended by the waiter to eat the lamb chop with our hands, accompanying this course came a napkin stuffed with a lemon slice and sprig of thyme. A waiter then poured a little bit of warm water over the napkins, creating the most gourmet wet-nap I’ve ever seen. 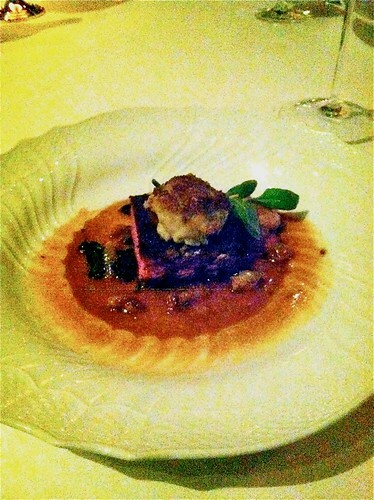 Finishing the savory courses was the impeccable Burnt Beef with Potato Torta and Calabrian Spicy Tongue Stew ($20 supplement). The Potato Torta was made of mashed potatoes that was mixed with marscapone cheese and then griddled to create a nice crust. The 30 day dry-aged beef was so tasty and cooked to a perfectly medium rare. Asheley was beyond full and could not finish her Burnt Beef. A waitstaff member suggested to have it wrapped to bring home. He let us know that her leftovers would be stored in the refrigerator until we were ready to leave and we could pick it up at the coat check. How ingenious is that?! At the end of the savory courses, the napkin that was in our laps was removed with two spoons by an attendant and was replaced by new napkins for dessert. An intermezzo immediately followed, which was a smooth and creamy cashew gelato topped with a refreshingly bright apricot sorbetto, garnished with apricot zest and sea salt. It was amazing and I would have happily eaten a whole bowl of this for dessert. 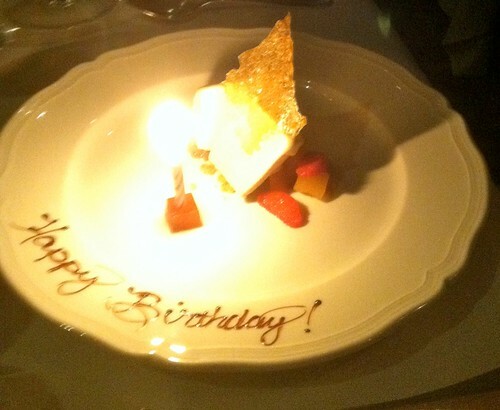 Both desserts were brought out at the same time, with a candle on Asheley’s and “Happy Birthday” written on the plate. There was unfortunately no loud rendition of a chain restaurant Happy Birthday sung by a parade of employees (sarcasm, if you didn’t catch that). Her Buttersctoch Semifreddo with Melon Agrumata (“citrus notes”) and Crumbled Sbrisolona (“cookie crumbles”) was out of this world good. A semifreddo, which is Italian for “half cold”, is pretty much just light, creamy gelato. It is typically made with equal parts gelato and whipped cream. 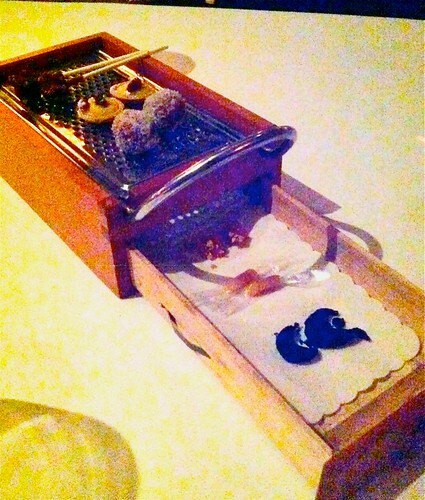 I highly recommend this dessert if you get the chance to dine at Del Posto! 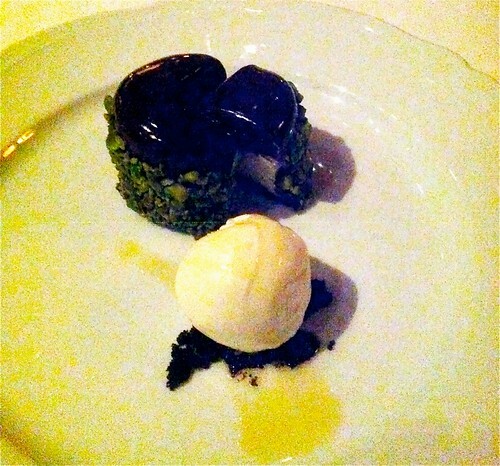 The Chocolate Ricotta Tortino with Toasted Sicilian Pistachios and Extra Virgin Olive Oil Gelato was also very good. Batali’s now signature olive oil gelato is always spectacular (you can also enjoy it at Otto), and the the cake was delicious… although I think we both preferred the semifreddo. At this point, you think the meal is complete, but out also comes an impressive presentation of six Mignardises (think Amuse Bouche, but dessert) on an old-fashioned box grater. My favorites were the tiny lollipop of gelato in a crunchy chocolate coating and the warm bomboloni (Tuscan fried dough pastry) filled with an orange cream and dusted in cinnamon sugar. There was also a delicious little cream tart topped with pomegranate seeds, free-form bitter chocolate truffles, dehydrated pieces of grapefruit that was rehydrated with grenadine, and little caramels in an edible wrapper. And for the final touch, we were given a little box of 2 super rich and decadent chocolate truffles upon leaving the restaurant.